Light up your love this Valentine’s Day with a visit to one of the world’s most magnificent natural wonders, Niagara Falls! 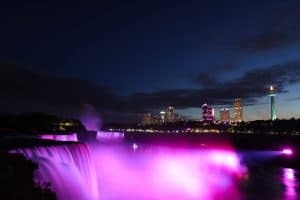 Thanks to Niagara Parks, the annual tradition of the Valentine’s Day illumination of the Falls with soft pink and red lights will once again set the backdrop for a romantic evening. Visitors can experience this themed light show on February 14th beginning at 7p.m and it will continue throughout the evening at the top of each hour for 15 minutes at a time. The Valentine’s Day illumination is in addition to the regular nightly illumination of the Falls, which takes place from 5:15p.m to 2a.m that evening. Don’t miss the opportunity to share this special moment with your sweetheart! With numerous hotel packages available, you’ll want to start planning your visit to Niagara Falls today! 12 Fun Things to Do in Niagara Falls – for Free!